Pink & Greige Valentine's Day Nail Art + Cosette Nail Shop Stamper Review! I'm not really one for traditional Valentine's Day colours or symbolism, so I thought I'd create a mani more true to my style using greige and pink! It was also a good opportunity to try my new Cosette Nail Shop stamper. I used my Nailz Craze NC03 stamping plate - not only because of the design, but the images on my other plates were simply too small for my nails. I used OPI Mod About You (pink), OPI Taupe-less Beach (greige/taupe), and Essie Beyond Cozy (glitter). I stamped over Mod About You with Taupe-less Beach, and vice versa. Now, on to the stamper. I bought this after reading Marta's (ChitChatNails) glowing review of it, and decided to bite the bullet and grab one as I've been after a new stamper for some time. The actual listing of the stamper I bought is no longer on Cosette Nail Shop, but it's basically the non-defective version of this one. Note that it's described as squishy, which was another big draw for me to this product. 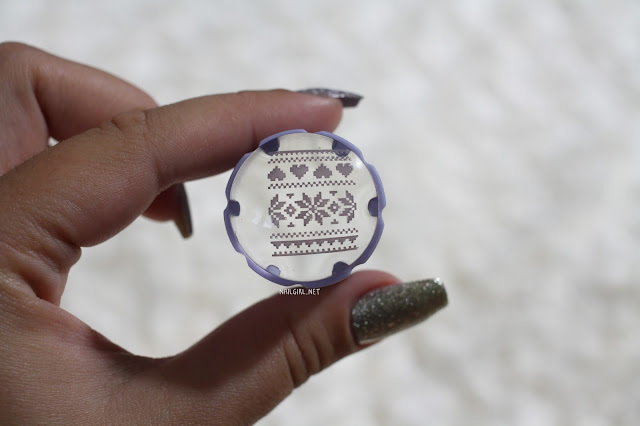 See through stampers are really cool to use as they help you line up nail art PERFECTLY on your nail, since you can look straight through it. I'm 100% sure that my stamping would not have turned out as perfectly straight if I had used a non-transparent stamper. You can see from the photos that it picks up images really well, and is best used in a rolling motion to pick up the image, then pressed straight down on the nail to transfer. Now, on to the only thing I didn't like - it's not squishy enough. I was really confused when it first arrived (and when I first used it) because it just didn't seem as squishy as described. Frankly, I wouldn't even use squishy to describe it. I did a little more research and found that this is apparently an older style of stamper carried by Cosette Nail Shop that is firmer than the completely see through stamper reviewed by Marta. However, this was only stated on the shop's Instagram account, and since ALL stampers in the shop are plainly described as 'squishy', I bought this under the impression that it had the same head as the completely clear one. If they're not equally squishy why describe them as such? I dug up my order confirmation email to see if I could find the original listing (I couldn't), but you can see that it's titled as a squishy stamper. To show exactly how 'squishy' it is, I made some short gifs comparing it to my MoYou rectangular stamper, which I would describe as very squishy. The short and the long of it? The stamper works (and it works damn well! ), but it ain't squishy. Have you tried any clear stampers yet? What nail art are you doing for Valentine's Day? Swatched: All of my NYX Soft Matte Lip Creams!